How to Paint a Piano – It's Much Easier Than You Think! If you’ve been thinking about painting your piano, then run, don’t walk, to your nearest paint shop and get yourself a quart of high-gloss enamel. You don’t have to paint it green, or any particularly bright color. But if you feel like your piano needs a fresh start, this is the cheapest, fastest way to go. I had been wanting to do this project for 9 years and kept getting intimidated by it. But there was no need for fear. It was actually very straightforward and is one of the most satisfying projects I’ve finished in ages. Here are my notes, in case you’re considering a paint job. The best candidate for something like this is a piano that’s not worth restoring. Ours was perfect. It was the piano I grew up with and it was pretty beat up when my parents originally picked it up for a bargain $300. By the time I inherited it, it was even more war-torn and the first thing I did was get 3 bids on having it refinished and restored. All three refinishers told me it would be about $2000 to restore the inside and $2000 to restore the outside and that the inside was just old, and even if it was restored it wouldn’t be as good as new. All 3 recommended sending this one to the junk yard and buying new. But new was out of our budget. And so was a $4000 restoration. I got some other opinions, and it was decided that the piano was good enough for lessons for the kids (the kids were babies at the time), and that we could get a more serious piano when and if our kids became serious piano students. So we just kept the piano as it was and I dreamt of at least giving it a shiny coat of paint. I kept the dream alive for 9 years. Some years I thought a glossy black would be lovely. But then I felt like black would seem like I was trying to make the instrument more formal than it really was. Later I thought maybe a white coat that we could sand down and make sort of rustic would be nice. Then for about the last 3 years I decided turquoise would be the right thing to do, but I never made it happen. When we were moving, the piano was so depressing I almost left it behind. But Ben Blair said we should bring it to Colorado. Saturday morning I was craving a challenge so I decided to finally tackle the piano paint job. When I got to the paint store I had a vision: go big or go home. I decided on Grass Green then and there. I bought one quart of hi-gloss enamel, one quart of primer, tinted to match the paint, and a paint brush. Grand total: $40. By Saturday afternoon I had primed it and painted 2 coats of paint. At that point, I decided the green was a little too yellow, so I took the remaining paint back to the paint store and asked them to green it up a bit. Saturday evening, I added one more coat and then came back to the project on Monday. Monday I did two more coats. Tuesday I did some touch ups. And tada! It’s finished. Unexpected thing: I can already see this will be the signature piece in our home. I had never thought about a signature piece for our home, but because I went with a bold color, now we have one. Every person that comes in the house is drawn to it. Everyone wants to touch the keys. It’s been played more in the last two days than it has been in years. Ben Blair wants to host a recital and call it Variations on the Green Piano. Seeing our newly painted piano makes me super happy. Green wouldn’t be right for every home, but it’s perfect for ours. I feel like I just bought this piano 10 more years of life. Next up: time to get it tuned. 1) The color is Benjamin Moore Yellow Green (but in my mind it looks more like grass green). 2) I didn’t use oil-based paint. 3) According to the paint store: yes, you should sand off any existing hi-gloss finish before you prime. 4) I don’t have any “before” pictures to share. I did have some. But they are gone. Because I am an idiot and mistakenly erased them. 5) Yes, I painted the bench as well. When I have the room more put together, I’ll share a photo tour. 6) I did not disassemble the piano, but an expert or less-lazy person would have. I painted with the keyboard closed. Once the paint was dry, I opened the keyboard and painted around it with a smaller brush. P.S. — More green piano photos. Plus, at what age should your child start piano lessons? It looks GREAT! Now I want to buy a piano so I can paint it FUSCHIA! awesome. the blair xmas recital definitely needs to start up again with this piano! Luisa, fuschia would be amazing! Liz, I was totally thinking the same thing. Maybe we should start it up again this year. Beautiful! I love how the green pops. What a unique piece it is now. PS They usually recommend you wait for the piano to acclimate before getting it tuned. Not sure how long. Our piano fits the old description perfectly. Maybe I will get brave and paint it. I like the idea of fuchia. wow. looks amazing. LOVE the color your choose! Simply awesome, Gabby. Ben, good idea to bring the piano to Colorado! I absolutely love it and wonder if I have the guts to paint mine. It’s got some scuffs and scratches and has seen better days. Hmmmmm. . .
You are my hero! Our piano is currently hiding in our coat closet (yes, we play it that much). The kids (ages 5 and under) like the C.S. Lewis feel of playing a hidden piano, but painting it would be awesome! I love it and everything it represents! It is a bit of you, tradition in the children learning an instrument, green for a new beginning, a fresh start and that it is a bold and boisterous statement piece for a family who love to enjoy life and celebrate their surroundings! Congratulations on the leap of faith! It looks great! Pssst, new knobs would also be fabulous. My cousin and his wife loaned us their old piano when they moved to Manhattan about 5 years ago. We’ve been so grateful to have it since a new piano wouldn’t have been in our budget and still isn’t. My cousin’s still in New York (I think they’ve moved to the Bronx) and we still have the piano, and I still haven’t gotten it tuned, although that’s been on my to-do list the whole time we’ve had it. Now I’m sorely tempted to paint it, but I guess it’s have to belong to me first. I think I’d have to go with robin’s-egg blue. Or maybe a cheerful, buttery yellow. I love it! Now I want to find things in my house to paint! um yes please! i told my husband i wanted to paint ours fire engine red, he looked at me like i was crazy. and now i’m going to send him a link! p.s., in response to kt’s comment about waiting to get it tuned, they do recommend that you wait. the guys who moved ours said at least two weeks, but i’ve also heard two months. Maybe it’s because we are canceling piano lessons for all 4 of our children next year because of this “economic downturn” or maybe it’s because I’m a big sap but reading this make me teary. Our piano is just like yours. When we have the tuner out every other year, he just shakes his head. We love it though and we love what it means to us. Music is a part of our family. We are hoping that by stopping formal lessons for a time our children will play just because they want to. I think your post may be what it takes to convince my husband that painting the piano (I’ve suggested many times) is not crazy. It’s awesome. Sorry for the long comment. Thanks for the inspiration. Oh, wow. It’s just beautiful. This is very inspiring. We have an old piano with similar lines. Wheels turning! I love it though I might have to paint mine RED! Bravo! It looks totally RAD. Elton plays on his red piano, the Blair’s play on their green piano. I love it! We had an upright piano growing up that my mom painted red. It was so festive. Reminds me of that. I love it when people aren’t afraid to paint something just because it is wood. Very impressive!! So, for clarification (in case I want to copy you! ), did you go w/ Yellow Green or Grass Green? I think we might have ourselves a Memorial Day weekend project . . .
the piano looks great! guiry’s is certainly my fav. paint store in the city! the piano looks so amazing! wow! Oh, Gabby, I love it. I really do. OF COURSE it is getting played more now. It is irresistible! You’ve made that piano very happy and created a happy spot in your home. I LOVE, LOVE, LOVE it!!! I’ve always wanted a piano in the home – even though it has been years since I have played. I would paint mine pink (where that would fit in my family home decor…I dunno) I admire you for having the courage to do it! Stay Fabulous Design Mom! I love this! And I have always wanted a red piano, so this is absolutely inspiring. But did you sand yours first? Did I miss reading that step? I love it! You may have just inspired me to finally paint ours black like I’ve been wanting to do for years…. But did you sand it all or just start with the primer? I’m obsessed. Did you paint the bench as well? I love the green. I’ve wanted to paint my piano forever, but couldn’t decide between red, aqua or a lima bean. I think you are converting me to green. Thanks for the inspiration! I love this idea so much I totally want to do it, but getting my husband on board would probably take years. I have a request–could you post a few more pics of how it looks from farther away? I’m just wondering just how big of an impact it makes in a room. We’re moving into a smaller house today and so I’m just curious what it would do to the space. I think everyone would love it if you’d post a few more, it looks great! 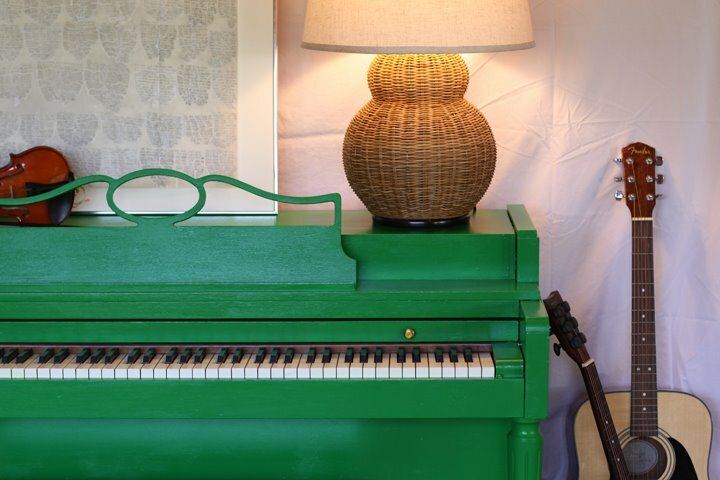 I wouldn’t think the idea of a green piano would look great, but it does!!! I love how it takes a traditional piece and makes it look so young and kid friendly! I love love love it – you’re going to start a trend here, I’m sure! That is the most amazing thing! I would never in a million years thought to paint a piano. And I thought it would be a million years before I could afford one. Now I’m on the hunt for one someone else thinks is beyond repair! That is outstanding, inspiring, and just a happy sight! Thank you for the endless ideas. We are moving in a few months and I am so looking forward to the refreshing task of decorating a new home. I love the green piano. A few weeks ago I decided to paint a side table orange… a little too orange once I was done. It is now green and I love it. I LOVE this. I have a piano that looks almost identical to yours (pre paint!) and I really want to paint mine now… I also teach lessons so I think it would be great to be the lady with the cute piano!! Thanks so much for the inspiration! Absolutely adorable. That is a great project that really gave alot of bang for the buck. Glad you trusted your instincts and painted it. Bravo!!!!!!!! Fantastic! I will soon be copying your piano and your table. Isn’t that the best form of flattery….? did you use oil-based paint? I never would have thought to paint a piano…I totally love the finished product! It looks a lot like the piano I grew up with! LOVE the green piano! It makes me want to go out and but my own junky piano and revive it. Thanks for the wonderful idea!!! The tuner is going to have a heart attack! Your post came at the perfect time for me – I think I’m ready to give it a try on old piano. Thanks for all the tips! i have a red one!! I LOVE love love this. I’ve also been contemplating painting my piano for a while! oh, that green!! it’s perfect! your wink and comment about standing on books cracked me up. I do respect the lady who commented on the other post for saying what she thought – its always good to hear from those who wouldn’t do what you were doing. Your response was funny and respectful. My mother in law gave us our piano that is old and only used when my daughter transfers her music from her recorder into piano. But my mother in law lives about a mile from here. Not sure I’m that brave. Not because of the color or the idea, but scared of her! Love it! I think you should name it “Rhapsody in Green”! i can’t tell you how excited i am to see that! We have an eye sore of a piano that i grew up with and was passed down to us. i too was thinking of painting it black, but now i see your amazing green piano and i think i’m in love. i will send you a picture when it’s done. thanks for the inspiration! Brilliant idea and it couldn’t look any better. I would love to have a crimson red piano…. i have an upright antique grand that i stole at a yard sale. i have wanted to paint it forever!! now just deciding what color. This is fantastic – I love coloured pianos (even work for a shop, http://www.chelseapianos.com, that sells them in London) and this is the best DIY version I’ve seen. I am so glad you posted this! it looks sharp and clean. My piano is in the same boat…needs paint, someday! Thanks for the inspiration. And I love that little violin sitting on the top (I am a violin teacher…grew up in logan, too). Perfect timing. We just moved last week and our old, ugly piano is still sitting at our old house. I was contemplating whether or not it was worth moving. I am so doing this! Thanks for the inspiration! One of my favorite posts ever. I’m totally stealing this idea. Thanks for sharing! Wow! that looks great. You did an amazing job. I wish I had the guts to paint anything. wow! great idea–i LOVE it!!! I have total piano envy. Something I’ve never experienced before. Brilliant. Thank you – thank you – thank you for this post! I’ve been trying to convince my husband that our ugly piano could be display-worthy if we painted it an awesome color, and he was a complete non-believer until I showed him this post. Now he’s thinking of color ideas. I LOVE this. I’m a big fan of painted furniure and this is just fabulous. We’ve been thinking about looking for a Craig’s List piano and now I know exactly what I’m going to do when we find one! ack! you beat me to it1 i’ve been meaning to paint mine ever since we got it. looks fabulous. this looks amazing! I love that green color. Maybe I would have like practicing piano more when I was young if I’d had a green piano. This makes my heart swell with love and happiness. So cheery. I am in love with this project — congrats! Painting my piano has been on mind my for sometime, since seeing a gorgeous white painted piano in a magazine. Thought it may be a lot more complicated to do, so thanks for sharing that!! This piano is Fabolous. Very Unique! I am sure it sparks a lot of conversation when it is viewed. The piano looks incredible. You can hear the accomplishment in your writing. It’s wonderful. Good job! i love how it’s inspired your family to play more. I thinks your kids will have a much easier time playing the piano with such a vibrant color. It is good for them to know that music is fun, a form of expression and art. They will be able to know that just by looking at the insrument. Brilliant!! LOOOOOOVE it. I am just itching to photograph it. HINT. Your keys look like they are in good condition; I have thought about the restoration as well but was deterred by the cost. The top of our piano has a leather-like covering; what do you think…can I paint that as well? I am intrigued and think I’m going for orange. My living room is mostly in those greens so I think the orange will really pop in the room. Gabs! You are so very brave! I just love that you did this. i LOVE it. sounds like a lot of work but totally worth it. love LOVE your idea and work! :) thank you for sharing! FUN colour for a piano… now you can belt out some COLOURFUL tunes as well! OOOH soooo FUN! I recently came across your blog and have been reading along. I thought I would leave my first comment. I don&#39;t know what to say except that I have enjoyed reading. Nice blog. I will keep visiting this blog very often. oh my gosh oh my gosh oh my gosh oh my gosh! I have been thinking about painting our old piano yellow for a couple of years…. this may just be the inspiration I needed. Thanks!! Ok. That&#39;s the best looking piano I&#39;ve ever seen! This is the post that led me to your blog. I am a musician and my instrument of choice is the piano – namely THAT ONE!